Toon allegedly pursue Swiss striker whilst our Argentinians attract interest elsewhere | NUFC Blog. £8.5m? Sounds a bit high. Newcastle United allegedly consider a Swiss striker to fill the gap left by Andy Carroll while there are rumblings of interest by other clubs in Fabricio Coloccini and Jonas Gutierrez. Well, Alan Pardew only has two and a bit days left if he wants to achieve his aim of signing a new striker before the Arsenal game. 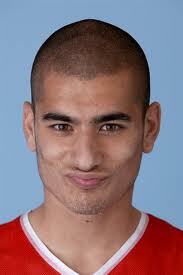 On which note the Daily Mail has us ‘interested in’ Bayer Leverkusen’s Eren Derdiyok. They allege that Graham Carr has been watching the striker and that we’re now ‘considering’ a move for him. The 6ft 3in, 23 year-old, Swiss striker started his senior career at BSC Old Boys where 10 goals in 18 games got him noticed by FC Basel. After moving to Basel he scored 27 goals in 80 games and thusly came to the attention of Bayer Leverkusen. They signed him in 2009 and he has scored 18 goals in 65 games for them, which is not what I’d call prolific. He has also played 33 games for Switzerland scoring 3 goals. The English media had us ‘interested in’ him back in June 2008 but the rumours failed to materialise into anything back then and I have my doubts as to whether they will now either. Judging by the stats alone, it looks like he’s the sort of player who started out extremely well but has not quite managed to maintain the scoring level that originally got him noticed. Assuming Graham Carr really is scouting him as the Mail suggests, it could come down to whether or not Carr thinks his recent less than impressive scoring stats can be overlooked in favour of ‘unrealised potential’ that can be exploited by Newcastle. The shocker though is that Derdiyok is estimated to be worth about £8.5m, which seems a bit high in my opinion. Although not as high as the fee quoted for Roman Pavlyuchenko whose £14m price tag allegedly nearly caused Ashley to choke on a passing bacon sarnie as he crossed the Russian off our most wanted list. On the outgoing front, it seems that our two Argentinians – Fabricio Coloccini and Jonas Gutierrez – are in demand by other clubs. Further to an article I wrote the other day it seems that Valencia are still interested in Coloccini, although the story seems to be simmering rather than bursting into flames at the moment. There are some reports that a £5m deal for the player could be in the offing but I’m not so sure myself. And the Mail mentions that Stoke are interested in Jonas. They only mention it in passing though, so maybe there’s little to it. Right, well I’ll clear off and have a look around the foreign press and see if there’s anything of interest in there. Is Vertonghen too pricey for us? bit of a blue steel look about him hey! If we sell Jonas & Colo then that is it as far as I am concerned!! Derdiyok, in my opinion is only slightly better than what we have, we need someone that is different to the lumbering target men we have, someone with an injection of pace to bring to the side, someone with flair, creativity and directness. We should have gone for Long or Martinez from Velez Sarfield (if we were ever really interested in them), it’s a shame Erdinc couldnt be swayed to buy into the toon as I felt he would have been a top, top player for us. Rumours at the club (Ponteland Golf Club) this morning is that we are after some Sporting Lisbon player that has been on our radar for some time and has recently rejected a contract extention. I personally like the look of the serb/slovakian at Ajax that we were linked with yesterday. Why pay that for him? We could get Sturrage for a bit more who is English and has a proven record. Makes no sense but what does at NUFC these days. Colo next to go then eh? I’m all for playing 4-4-1-1 with Ba up front on his own, HBA behind him. For now due to HBA being out I’d give Vukic the chance to shine in that position. I’m now of the opinion that we shouldn’t rush into signing a front man until such time as we offload Ranger/McLoven/Xisco or all three. Somebody on Twitter is suggesting that Bendtner has arrived at Newcastle Airport. Mmmm? what happened with Kerrison from Barca? Kerrison would be class, I’d also like to see Moussa Sow arrive but that’s just a pipe dream. Bendtner may well have arrived at Newcastle Airport. We do have a game against his team in a couple of days. Perhaps he came up early to sample the Quayside on a Thursday night. Used to be one of my favourite nights out in Newcastle a Thursday. I think Thursdays was when Rockshots used to let straight people through the door. Not that I ever went, just saying like. another one for the future? Airey has gone to Hibs for a 6 month loan spell. Can I ask, if its true as the rumors say that we have sold Enrique for 5.5 mill is that less than what we paid for him 3 years ago? If true why? Surely players are supposed to appreciate in value if they are seen a being good. Why would MA sell for a loss, its against his principals. tooneye, I must have anticipated your question with my latest article (just posted). Apparently there’s £2m to come on top of that if he performs well. Looks a bit camp…so may link up well with xisco. Think 98% of players we have been linked with I have never heard of anyway. we cant afford/wont pay for anyone that people will have heard of? I was beginning to think that myself. ffs,how many times has this lad been mentioned since ashley turned up?.he’s up there with tranquilla barnetta,who has also been linked loads of times. is this ashley putting out this crap,as these are the only names of players he knows?. if arda turan,gokhan inler and the young kid from norway are linked,you will know it’s bull. sirjasontoon,do you not think it’s strange,that we get linked with the same players every window. I have to admit, I am noth thrilled to see all the headlines on the web about Shola penning a new contract. I find it frustrating and dissapointing that that is supposed to be good news. NUFC have really screwed up looking for a striker this late, with all the problems involved in finding one any way. So we will end up with bendtner or some player we never warm to, just for AP to say he has done what was required. GRRRRR, and Enrique away for less than we paid for him. Liverpool must be getting a discount on him for the AC purchase!